Superset compound exercises to get even better results. Burn fat, build lean muscle, increase strength and boost fitness all at the same time. Sound too good to be true? Amazingly, not only is it possible, but it's actually pretty straightforward too. Full-body workouts have long been known to be the best way to burn maximum calories, ramp up your metabolism and build muscle. With the introduction of an intriguing new technique known as supersetting, however, you can make your full body workouts even more effective. Daily training potentially sounds like a recipe for disaster. The American Council on Exercise advises that muscles need around 48 to 72 hours to recover between workouts. However, many athletes, including Olympic weightlifters, train the same muscle groups and perform the same exercises on a daily basis and have great success. The key is to regulate your intensity -- if you're feeling strong one day then work hard, if you're feeling weak the next, don't be afraid to lower the intensity and have a slightly easier workout. You're not wimping out, you're being smart and listening to your body. A superset involves performing all your repetitions on one exercise then moving immediately to the next with no rest. After performing both exercises, rest for 60 to 90 seconds before starting on the first one again. Supersetting increases your heart rate, boosts your metabolism, makes you work harder and thus burns a higher number of calories, claims Mark Schuenke, anatomy professor at the University of New England College of Osteopathic Medicine in Maine. You've got to move quickly between the two exercises to get the benefits though; this means you might have to rush the guy doing biceps curls so you can begin the second exercise of your superset ASAP. The most common method of superset is known as antagonistic. 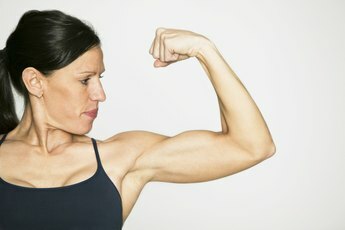 This technique requires that you perform an exercise for one muscle group then another for the opposite muscle group, writes strength coach Cassandra Forsythe in "The New Rules of Lifting for Women." Superset your quadriceps with hamstrings; your chest with your mid-back; shoulders with lats; abdominals with lower back and biceps with triceps. In theory you can superset any exercises -- just make sure you're not supersetting squats with chatting with a friend or lunges with admiring your reflection in the mirror. These don't work so well! There are six basic movement patterns that should be included in your workout, notes strength coach and powerlifter Nia Shanks. These are a squatting movement, a deadlift, a horizontal press, a vertical press, a horizontal pull and a vertical pull. To put these in context, an ideal workout would be front squats superset with stiff-legged deadlifts, bench presses superset with barbell rows and lat pulldowns superset with dumbbell shoulder presses. You can mix these up depending on what you want to work, what exercise you're comfortable with and how you feel on that day.